Gustav Robert Kirchhoff (March 12, 1824 - October 17, 1887), was a German physicist who contributed to the understanding of the basic concepts of the theory of electrical circuits, spectroscopy, and the emission of black-body radiation generated by heated objects. He coined the term radiation "black body" in 1862. There are three different concepts of physics, later named after him, "Kirchhoff's laws", each in electrical circuit theory, thermodynamics, and spectroscopy. Gustav Kirchhoff was born in Königsberg, East Prussia (now Kaliningrad, Russia), the son of Friedrich Kirchhoff, a lawyer, and Johanna Henriette Wittke. He graduated from Albertus University of Königsberg (now Kaliningrad) in 1847 and married Clara Richelot, the daughter of his mathematics professor, Friedrich Richelot. In the same year, they moved to Berlin, where he received the title of professor in Breslau (now Wroclaw). 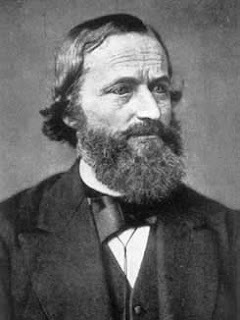 Kirchhoff formulated the law of the circuit, which is now used in electrical engineering, in 1845, when he was still a student. He proposed the law of thermal radiation in 1859, and proved in 1861. In Breslau, he collaborated in spectroscopic studies with Robert Bunsen. He is the co-discoverer of cesium and rubidium in 1861 while studying the chemical composition of the Sun via the spectrum. 1. When a liquid or high pressure gas, will produce light with a continuous spectrum. 2. When a low-pressure gas dipijarkan object, will produce light with an emission spectrum, in the form of bright lines at discrete wavelengths (in particular color) depends on the energy levels of the atoms contained in the gas. 3. When a continuous spectrum of an object is passed to a low-pressure cold gas, will produce light with the absorption spectra, in the form of dark lines at discrete wavelengths depending on the energy levels of the atoms contained in the cold gas.